For Manchester United fans, it looks like Halloween has arrived earlier than usual. The same issues and indicative tones that have plaqued Jose Mourinho's teams historically, albeit during his third seasons, is rearing its ugly head early on. Mourinho is a great coach no doubt, and his results used to show that. Unfortunately, these days, the results, which gave a measure of method to his madness, is not what it used to be, and with that comes the incessant criticisms. The tactician has benched his record signing for the past two games, instead trusting a youngster Scott Mctominay for the starting spot. This obiously hasnt gone down well with the Frenchman who was also substituted in the games against both Tottenham and Newcastle. Fighting his players, or losing the dressing room is the first sign of what has become a career signature for the Portugese tactician. From here, things only go downwards. At Real Madrid, the first indication of what was to come was his clash with Casillas, and later, other players. At first, it looked as if he was winning. That myopic notion was fuelled by the wanning prowess of Iker Casillas who was subsequently sold to Porto at the first opportunity. 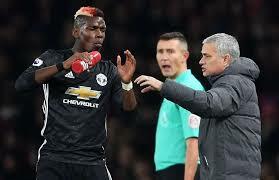 But the discord in the dressing room could not be solved easily, and it engulfed into an inferno that burnt Mourinho's credibility with the Spanish giants that ultimately cost him his job. The same signs were evident during his second spell at Chelsea. He clashed with players, most especially Eden Hazard. Unlike Casillas, Hazard was Chelsea's best player and benching him would have been counter-productive (although Mourinho still tried). Unlike at Madrid too, Chelsea was unable to find a short-term solution, and so had to ride on, hoping the waves of negativity surrounding the Club would not push them into relegations waters. And it almost did. So, they had to sack the Portugese. Manchester United, who knew Mourinho's history yet decided to stick with him must be having a sense of Deja-vu. The stories coming out of Old Thradford are all too familiar. The familiarity also comes with the inevitable - a severing of ties after inreconciliable differences after players have downed tools. First Pogba, but who would be next? For many, especially rival fans, the whole situation might be fun and a cause for endless banter, but for me, he has become predictably boring.